Johnny, born John James Richardson on November 9, 1962. Which, if you knew him, you most likely knew his birthday and you were always invited to his party. He made it a point to invite everyone he talked to, even if it was the day after his party and there weren't party plans in sight for the following year. Johnny brought his charisma everywhere he went. Since he was a kid, he loved bowling, fishing, landscaping, music, scary movies and anything emergency response related. He was a fireman at heart and represented them proud every where he went. Johnny may have lived in Riverside R.I. and Chepachet R.I. but in his mind, Onset was his home. Spending his childhood summers along side his late parents, John James Richardson and Mildred Everyln Richardson, Johnny became a staple in Onset. 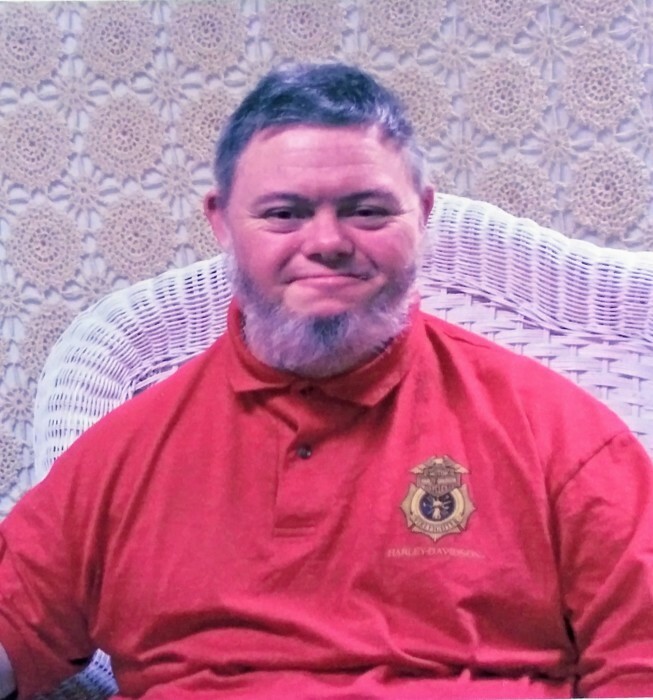 If he wasn't at Shell Point fishing , at Marc Anthony's spinning pizzas, or listening to music at the band shell, you could always find him visiting the Onset Fire department. Johnny made many memories throughout the years working at The Arc in East Providence and Seven Hills in Woonsocket. He made many friends and he became a Jack of all trades. Johnny had a passion for all things music. This passion grew as he got older. He could play the harmonica like no other. He loved being center stage, playing and singing for others. Johnny loved his sister Karen Timoteo more than anything. He spent many years joining her in everything she did. He loved to go to work with her so much that one time he hid in the back of her truck bed until she got to work, just so he could join her. He looked forward to their weekend adventures, where he could always be seen playing on his 4 wheelers or tractors. The two of them were rarely seen apart. He always made sure everyone knew his sis Karen. Johnny's brother Thomas, "Tommy", as he loved to call him, Tommy's wife Gisele Richardson, their daughter Carol Clark with her husband David, and their 2 children, are amongst the few able to call Johnny family. Johnny's nieces and nephew, Keri Timoteo, her fiancee Joshua Lusignan and their daughter Zoey Lynn, the late Stacy Lynn Timoteo, Nicole Timoteo (whom Johnny always referred to as Nix or Nixon) and her Wife Korinne Timoteo, Kyle Timoteo with his wife, Ariane Timoteo and their son Greyson Peter, all meant so much to him. Johnny enjoyed anything that had to do with them and looked forward to his time with them all. Johnny never passed up an opportunity to tease each one of them by taking their money or car keys, proposing to marry their significant others, or taking their friends on wild rides on his four wheeler. Amongst many friends, he also left behind his dear cousin Scott Cinq-Mars. Their adventures are still held secret, as we don't know exactly what kind of trouble they got into. Johnny cherished his time with John Cox, who shared Johnny's love for music and fishing. They spent many nights listening to music and having a "chug-a-lug". Calling hours will be from 9:00 AM - 10:00 AM on Friday March 22, 2019 in the Smith-Mason Funeral Home with a funeral service at 10:00 AM . Burial will follow in Little Neck Cemetery, Riverside, RI. In lieu of flowers, donations can be made in Johnny's memory to the Onset Fire Department, 5 Central Ave, Onset, MA 02558 or the Chepachet Fire Department, PO Box 755, Chepachet, RI 02814.